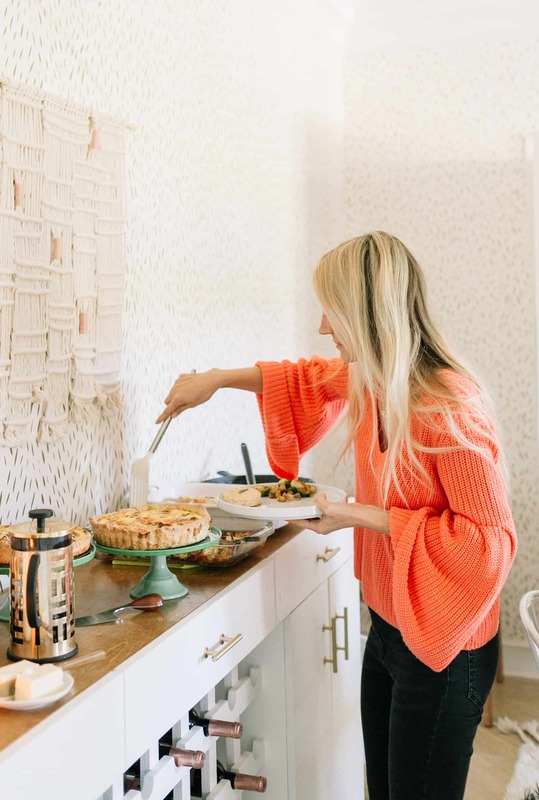 This might be a favorite Friendsgiving yet, and most of that is due to the fact that we decided to do brunch! 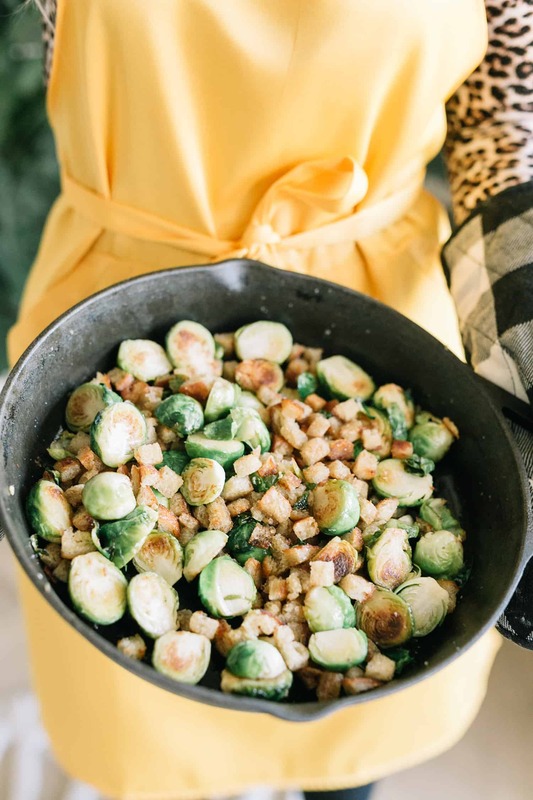 I love breakfast foods and it was fun dreaming up some recipes that feel like Thanksgiving but are also breakfast options. 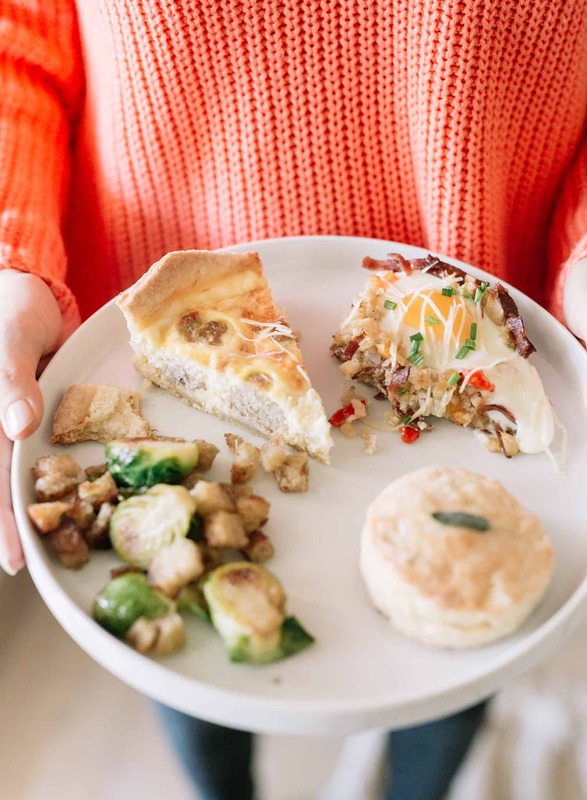 And I think this turkey meatball quiche just might be my favorite dish from our meal this year. It’s so good! 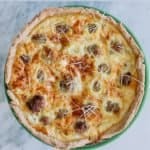 I think this quiche would be a fantastic dish to bake for any holiday, including Christmas morning. It just feels a little bit elevated. Plus, this recipe will make two standard size quiches, so it will easily feed a small crowd. It’s a good one for if you have guests in town. I made the turkey meatballs the day before our event. I fully cooked them and then stored in the refrigerator overnight. I also made the quiche crust the night before. Then, on the morning of our Friendsgiving, I rolled out the crust and easily threw together the filling, including the ready-to-go meatballs. 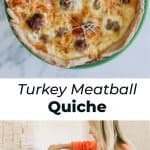 For holidays, and especially for dishes you have to wake up early to make, I love a little make-ahead hack so it’s just a little easier. To make the crust, combine the flour and salt in a large mixing bowl. Cut the cold butter into small cubes and use your (clean) hands to rub/crumble the butter in with the flour. The mixture will come to resemble small pebbles. Add the cold water and stir, then press into dough. I usually begin by using a spoon and then use my clean hands again. If the dough will not stay in a ball without crumbling, add another tablespoon of cold water. You want to use the least amount of water you can, but you do want the dough to hold together. Wrap in plastic wrap and refrigerate for an hour or up to two days. If your meat is frozen, be sure to thoroughly and safely thaw it first. In a medium sized bowl, combine the bread crumbs and milk. In a large mixing bowl, combine the egg, garlic, celery, onion, and Parmesan cheese, stirring until just combined. To this large bowl, add the ground meat as well as the bread crumb mixture (which by now should be quite soggy). Mix well. Season well with salt and pepper. Form the meatballs. You want meatballs that roughly fit in your palm. Think just a bit smaller than cookies, around 2 tablespoons each. 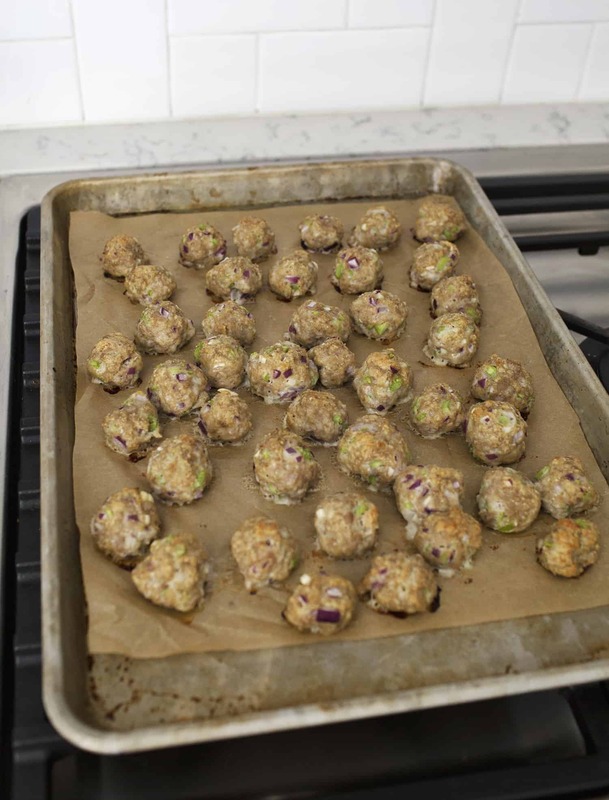 Set the meatballs on a baking sheet lined with parchment paper. Bake at 400°F for 18-20 minutes. The meatballs should be at or higher than 165°F if you use an instant read thermometer (which I really like using when I cook meat as it takes away the guessing of if it’s been cooked enough to safely eat). Remove from the oven once done and allow to rest for at least 5-8 minutes. They will appear super juicy just out of the oven and some of these juices (fat) will solidify a bit more as they rest, so it’s good to let them do this before moving to a serving dish or storing in the refrigerator. Roll out the dough on a floured surface. 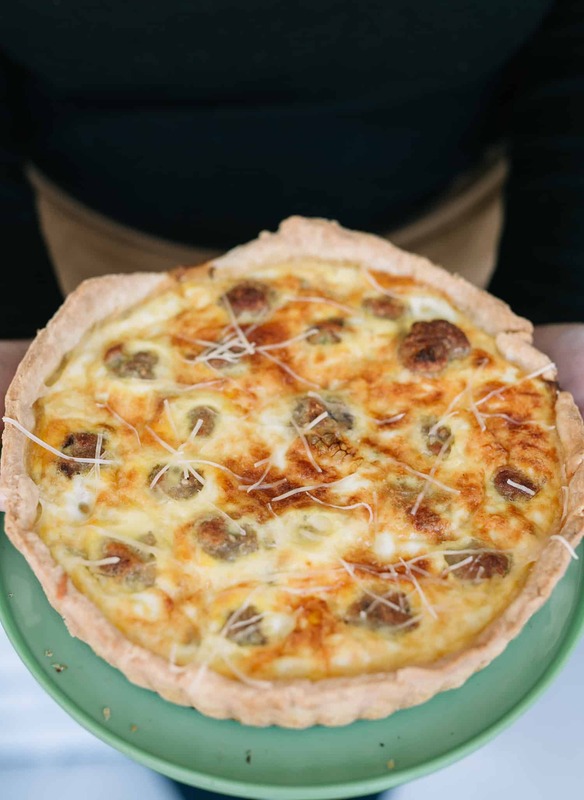 Butter or spray your quiche pan, then lightly dust with flour. This will make a deeper quiche, so you want a larger pan than just a standard pie pan here. 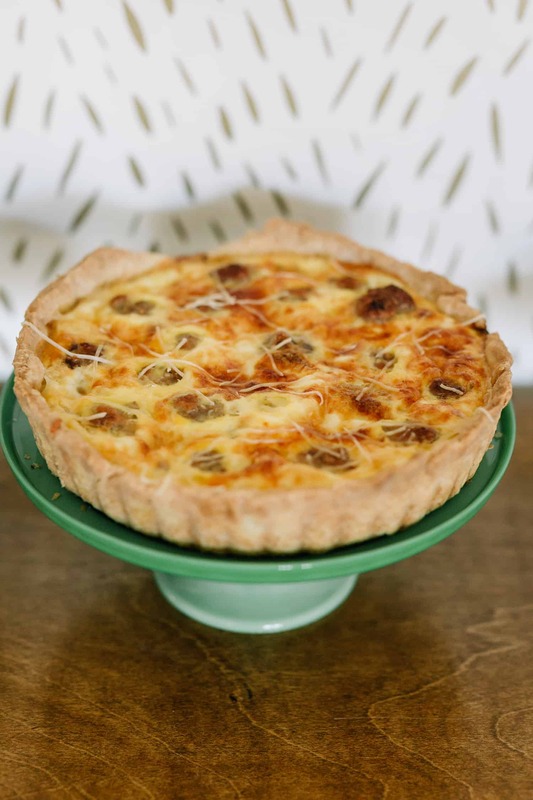 I love this quiche pan because it has a removable bottom, so it’s super easy to get the quiche out and keep it looking pretty after it’s baked. Bake at 400°F for 5-8 minutes. Meanwhile, whisk together the quiche filling ingredients. Then add the meatballs to the quiche pans and pour the filling over them. Continue to bake for another 45-50 minutes. Allow to cool for about 10 minutes before slicing into the quiches. 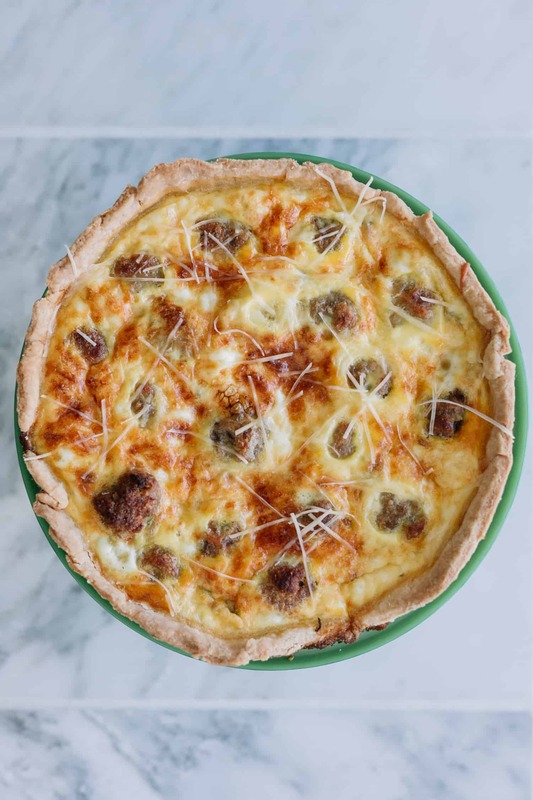 This recipe will make two standard size quiches (in a spring-form pan, like you use for a cheesecake, or a removable bottom quiche pan). Credits // Author: Emma Chapman. Photography: Amber Ulmer. Photos edited with A Color Story Desktop. That looks super delicious, this would definitely be an option for my New Year’s Eve party! Thanks for sharing this!